When you think of holiday desserts, you probably think of something warm and spicy like pumpkin pie, or something rich and heavy like flourless chocolate cake or even a chocolate truffle from a gift box. In the southern hemisphere, however, Christmas comes during the height of summer and yuletide treats tend to look more like something an American would expect to see at a July barbecue. And though serving a cold dessert might not be your first instinct at a Christmas party here, our counterparts in Australia might just be on to something. It turns out that ice cream can be the perfect, refreshing end to a holiday meal – a way to wake up taste buds lulled to sleep with heavy flavors and textures. With seasonal flavors like pumpkin and peppermint, a dessert made with ice cream can be just as appropriate as any fruitcake. Best of all, an ice cream dessert isn't terribly labor intensive – assemble it in a few minutes and then allow it to firm up in the freezer for a few hours and you're good to go. One of the easiest ways to serve ice cream at Christmas is to make "snowballs." Simply scoop any flavor of ice cream with a round scoop, roll it in your favorite ice cream sprinkles (I like a mixture of cookie crumbs and mini chocolate chips), and then place on a sheet pan lined with wax paper in the freezer until it's time for dessert. Serve in a pretty dish. Years ago, my mother-in-law came up with the dessert recipe I've shared here. Sitting in the pan, it doesn't look like much, but once it's cut and you can see the layers it contains, it makes a beautiful presentation. One year I made this for a New Year's Eve party a friend and I hosted together. She made mini molten chocolate-mint cakes and we plated them with small portions of this dessert. The warm cake and the cold ice cream together were a wonderful and delicious way to ring in the new year. I've served this too many times to count and have even taken it to potluck parties – don't worry about it melting on the buffet table, people eat it too fast! Place ice cream on counter to soften for five to ten minutes. Meanwhile, unwrap the ice cream sandwiches and line the bottom of a 9 by 13 inch pan with them, using a sharp knife to cut sandwiches as needed so the bottom of the pan is completely covered. Using a stand mixer, blend softened ice cream until smooth, then spread over the ice cream sandwich "crust." 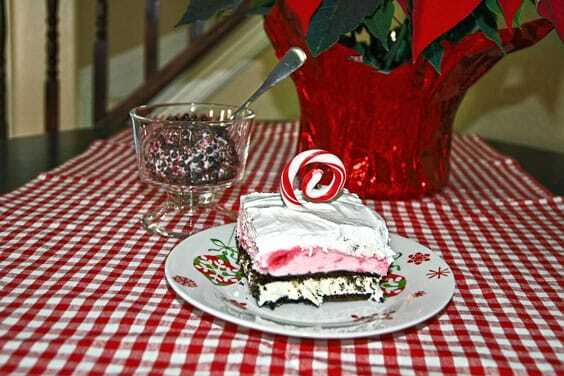 Spread whipped topping over ice cream and cover the dessert with foil. Place in freezer for at least two hours before serving. Allow dessert to sit on counter for about five minutes before serving. Cut as desired and garnish with peppermint candy.